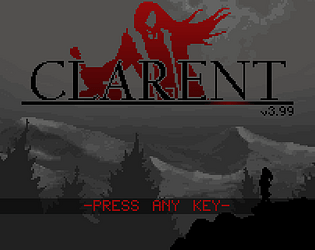 Game play footage of Clarent. I played with an Xbox controller after a while. With that, this game is a blast. Thank you for the experience! This is still the most promising game around here, and I understand about the lack of progress from last time due to hardware failure (Hope you can resolve it soon) I'm still really impressed with what's here. Devil Triggering is great, and the new enemies are pretty cool and complex. Keep at it. One of my favourites AGDG games. A small toggeable arrow showing you where to go in the map could be useful. I got lost for a while in one room and didn't figure out that jump intil I saw it done in a screenshot here. Checkpoint room at the far right can be missleading. You can climb the wall and there is clearly a small space on top of it, but it leads to nowhere. Sometimes it looks like you landed a hit on the crow (specially with the bigger swords) but you didn't. A cleared/visited percentaje/room indicator in the map screen would be great (some time ago I asked you a screenshot of the full cleared map to checkif I missed something) Check how the map works on LoS: Mirror of Fate. How it shows you where to go and where have you been, is really good. Again, love this game and hope to see more of it soon.